Human immune cells are remarkably adaptable. These foot soldiers of the immune system can be harvested from the body, retrained to recognize and fight different diseases, and then redeployed in the body. This process, known as adoptive cell transfer, has incredible potential for treating cancer or chronic infections–particularly in individuals whose immune systems have been weakened by diseases like AIDS. There is, however, a big problem with this technique. Immune cells that have been harvested and engineered to fight specific diseases can often go haywire and turn their weapons on host cells. As a result, healthy cells and tissues in the body that aren’t supposed to be attacked by immune cells get caught up in the crossfire and end up as casualties. As a solution, biologists want to keep these immune cells in line by reprogramming their behavior using the very tools that bacteria employ to slip past our immune system. On the surface of immune cells are receptor proteins that act like guardians at an outpost. At the first sign of the enemy—usually, bacterial proteins that bind to the receptors—these guardians sound the alarm by “lighting” a beacon. This signals to the other beacons to be lit as well, thereby alerting the immune cell of impending danger. Inside of immune cells, however, this “relay of beacons” is actually made up of proteins that chemically modify other proteins in a cascade. Each time a protein modifies another protein, “word” of the intruder is spread throughout the cell until it finally triggers an immune response. As a result, immune cells release a volley of helpful molecules—some recruit reinforcements, some mark the bacteria as the enemy, while others make immune cells more effective soldiers. Finally, when the alarm reaches the nucleus—the cell’s central command—orders are sent out for the cell to rapidly divide, making even more immune cells to help in the battle. Many disease-causing bacteria, however, have evolved a vast array of smoke bombs, stealth cloaks, and other weapons to sabotage our defenses. For instance, when the diarrhea-inducing bacteria Shigella flexneri infects the body it plants a bomb to disrupt the warning beacons. S. flexneri produces a protein called OspF that interacts with the protein MAPK (mitogen activated protein kinase) and prevents MAPK from modifying other proteins. With MAPK unable to “light its beacon,” the alert system is short-circuited leaving the immune cell in the dark and unaware of an attack. While conventional wisdom is to make drugs that target OspF, some researchers see an opportunity to exploit the use of OspF. Since OspF can sabotage the immune response, scientists now want to use this “bomb” as a way to prevent immune cells from attacking other cells in the body during adoptive cell transfer. Finally, the researchers were able to manipulate OspF to interact with and sabotage different proteins by tinkering with the OspF gene and expressing it in yeast cells. Proteins interact with one another through domains that function like clothing fasteners. Proteins also have different interaction domains just as clothing have different fasteners like Velcro, zippers, and buttons. By swapping the “fastener” domains in OspF, the researchers were able to “stick, zip, or button” OspF to different yeast proteins. Although this experiment was done in yeast, the yeast proteins the researchers targeted for sabotage can also be found in the “warning beacon relay” of immune cells. This opens the door for scientists to specifically target OspF to different proteins in immune cells. Since the alert system triggers different responses in immune cells, this strategy can be used to pinpoint specific beacons in the relay and shut down either the entire immune response or only specific branches. The work done by Lim and colleagues demonstrate that OspF can be used to reduce the firepower of immune cells and order a ceasefire. These results highlight the potential for using bacterial proteins to reprogram the behavior of immune cells in adoptive cell transfer therapy. 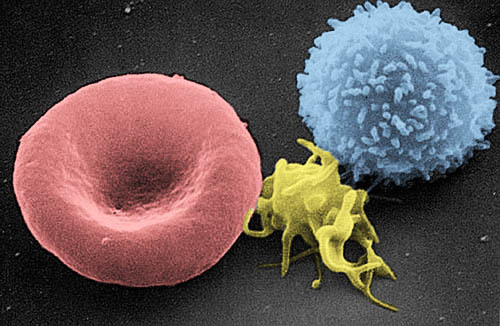 Changing the behavior of immune cells, however, is one thing. Effectively mounting a counterattack against pathogens without harming the body remains another. Since these experiments were performed in immune cells outside of the body, the next step in this research is to deploy these reprogrammed foot soldiers back into the body. Then we’ll see how effective they are against actual bacterial invaders while limiting innocent bystander casualties due to friendly fire. Wei P, Wong WW, Park JS, Corcoran EE, Peisajovich SG, Onuffer JJ, Weiss A, Lim WA. Bacterial virulence proteins as tools to rewire kinase pathways in yeast and immune cells. Nature. 2012 Aug 16;488(7411):384-8. doi: 10.1038/nature11259. PubMed PMID: 22820255; PubMed Central PMCID: PMC3422413. Featured image credit: Lord of the Rings – Return of the King – Blue Ray Edition. The dork in me really likes the LOTR references. It really makes it easy to understand everything when you can relate it to fiction and fantasy. I have a few questions: When the command is sent to “reduce the firepower” or to completely “ceasefire,” how long does that last? Basically, if the command is sent, at what point will the immune system sort of re-boot and start attacking again. As a lay person, I’m just guessing that permanently weakening or turning off the immune system isn’t a good idea, so it is probably temporary. Is this only done once an infection is no longer present? If so, does doing this make the body more susceptible to infection or does it only target the out of control cells? This strategy only effects those immune cells that have been harvested and retrained (as used in adoptive cell transfer). It shouldn’t affect the “normal” immune system. The way OspF works is that it permamently disables MAPK. Therefore, as long as OspF is being produced the alert system will be turned off at the point of MAPK. This is why the doxycycline system is really elegant because it gives you an element of control. If the immune cell is removed from the presence of doxycycline, then OspF won’t be produced anymore. This gives the immune cell a chance to make “new” MAPK to replace the permanently disabled MAPK proteins. This should restore the relay. All of these experiments have been done outside of the human body, so more research will need to be done to see if “reprogrammed” immune cells will still attack cells in the body. Let me know if anything else needs to be clarified. Thanks for your comments!